We have designed Cambridge IGCSE® and O Level Environmental Management Coursebook for the IGCSE (0680) and O Level (5014) Environmental Management syllabuses, for first examination in 2019. 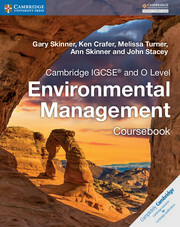 Cambridge International Examinations endorses this coursebook for full syllabus coverage as a mark of quality and reliability. 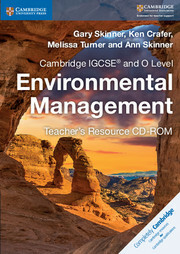 Internationally focused case studies demonstrate real-world environmental issues, while practical activities develop students’ investigative skills. 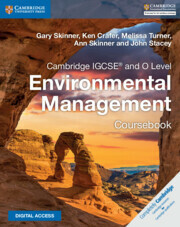 This Cambridge Elevate enhanced edition contains engaging digital extras, including extended case studies with questions and answers, as well as auto-marked formative assessment questions for helpful examination preparation for Environmental Management. Case studies in every chapter provide opportunities for students to apply their knowledge and understanding to new scenarios. Furthermore, they help students develop higher-order thinking skills such as analysis, evaluation and critical thinking. The pre-chapter, midpoint and end of chapter auto-marked formative assessment questions consolidate knowledge and understanding of content. 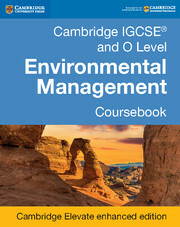 For more information on how to use Cambridge Elevate editions and on supported devices, please visit elevate.cambridge.org/support.